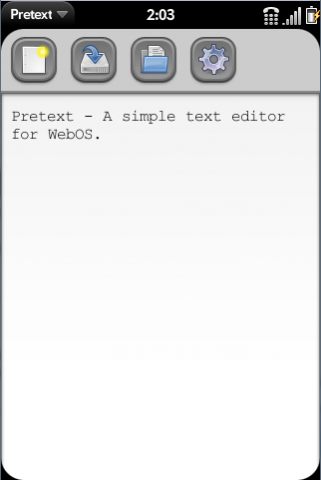 A simple text editor for WebOS. CURRENT FEATURES: Ability to save to and load from a folder on the USB partition. Ability to change fixed width font and font color. NOTE #1: currently all files are stored in a folder called 'pretext' on the usb partition. NOTE #2: You MUST have the filemgr service installed to use this app.